*2.75 stars*Between me and you, this started out on a promising note, but somewhere around the halfway mark, my feelings started to wane—big time.Allison Winn Scotch delivers a dose of reality with Ben and Tatum’s relationship—no matter how intoxicating things starts off, nothing is ever perfect. There are some moments of brilliance sprinkled throughout the pages and plenty of passages I found myself eating up, but unfortunately the things I didn’t care for cast a much bigger shadow.My major contention with this story is the way it’s told—notably the flip-flopping timeline—Tatum’s perspective is told in chronological order, while simultaneously, Ben’s perspective of their demise is told in reverse. The result can only be described as a scattered mess. Until you manage to gain somewhat of a foothold and wrap your mind around what the author is striving for, you'll be forced to find some semblance of balance by piecing things together yourself. Bottom line, prepare for some confusion.Not only is the method of delivery messy, it’s extremely repetitive. Naturally, with two characters relaying their version of the same events, there’s bound to be some overlap, but this much? The sheer number of things that were crammed down my throat, over and over—Ben’s projects, Tatum’s mother’s motto, the loss of their parents, their not so cutesy after the fifth time, “I see you” moments—made me want to scratch my eyes out. I’m sorry, I don’t do well with regurgitated information that adds absolutely nothing but filler to the storyline and there’s a ton of it here. If you took all of that away, what would be left standing? Was the delivery a ploy to mask the mundane?To further add to my growing list of complaints, let’s talk about Tatum and Ben for a minute. The author tackles a host of issues with these two—resentment, jealousy, lies, and infidelity—but she failed to deliver the deep, unwavering intensity a story like this demands from its lead characters. Sure, the words were there, but the underlying feelings were somehow absent. Smothered by internal monologue, maybe?Despite Ben's declarations—ad nauseam—that he could see the real Tatum, I never felt like I did. What I saw was a spoiled actress playing a role, alongside her selfish husband. To further drive the nail in the coffin, the fact that Tatum excused away what Ben did so easily, not only downplayed the situation, which felt ignorant on some level, but also succeeded in contradicting the underlying message of the entire story—all relationships take work. Instead, we’re served up a cornball ending that highlights what exactly, playing pretend is actually the better way to go? *Thank you to Lake Union Publishing and NetGalley for a copy in exchange for an honest review. This was my first read by Allison Winn Scotch and I was super excited to have a dose of a romance. Well.... I was pretty disappointed. :(Between Me and You started out on a bang but it started to slowly lose it's sparkle and just lost me big time.The biggest issue I had with this novel was how it's told (dual perspective). I usually LOVE dual perspective but wow was this a serious hot mess. This was ALL over the place and not in a good way. Tatum Connelly's perspective is told from chronological order and Ben's perspective is told from the opposite/reverse order. All I can say is be prepared for some MAJOR confusion when you tread these waters. Honestly, I'm not sure at all what the author was trying to do with the timeline but it did not work at all for me. Not only did I have issues with the delivery, but also the repetitiveness. Either we heard about "I see you" moments or Ben's writing projects. I felt like the story was a bunch of fluff without the actual meat. I was rolling me eyes pretty much the entire story. And, let's be honest. The author brings up some serious issues that Ben and Tatum have experienced. Infidelity, resentment, and trust. The characterization was lacking BIG time with Ben and Tatum. I was expecting to hurt when Ben/Tatum were hurt. I expected to be happy when Ben/Tatum were happy. Nope.... the feelings to her characters were absent. And... wow Tatum was a spoiled brat. Ben... was also a jerk and extremely self-centered. YIKES!!! The ending?..... also was horrible. Cheesy and unbelievable. The story held promise but unfortunately it did not live up to my expectations. Overall 2.5 stars for this one. But, I have heard some amazing things about this author's previous novels... so I would check out this author in the future. Thank you so much to Netgalley and Lake Union Publishing for the advanced arc in exchange for an honest review.Publication date: 1/9/18.Review posted: 1/15/18. I was fortunate enough to get an early reader copy of this from the author. I just finished it and this is clearly Allison's best book to date. It's an ambitious premise--tell the same story from two perspectives, the story of a marriage--but start one timeline today and work backwards, and the other at the beginning and go forwards. This could so easily have ended up with too many retellings of the same events, and no surprises, but that's not what happens. Instead, what happens is a love story, a LIFE story, that has its ups and downs and surprises and twists and YES, left me teary eyed at the end. Love stories, romantic comedies on the page or on the screen, often leave you feeling manipulated, but again this book doesn't go there. Rather, it follows the lives and changes of two people over twenty years, the way life is: messy and simple, complicated and fun, sad and amazing. One more thing: there is a chapter in the book that takes place on 9/11 where my heart was in my throat even though I knew what would happen, even though I knew there couldn't be a happy ending to that day. That is the best writing, which this book is. My verdict: put this book on your to-read list immediately and start counting down the days to its release. Bravo, Allison. Thanks to the author, the publisher and NetGalley for a free electronic ARC of this novel, received in exchange for an honest review. “Between Me and You” by Allison Winn Scotch is a love story, if I had to sum it up. It centres on Ben and Tatum, a power couple in Hollywood (he- a screenwriter, she- an actress) who seemingly have it all. This novel chronicles their lives from the time they meet until present day, detailing their daily challenges on the rise to the top. This novel is told in bits and pieces and it jumps around a lot- only the very last segment is told in chronological order. A reader goes from present day, to when Tatum and Ben meet, to two years after that. It is clearly marked in the novel but this format was a bit difficult to read and follow. I would’ve liked this story better if it was told in order, I think, although I understand the reasoning.I enjoyed this novel more than I thought I would. I am not normally a fan of women’s fiction and romance novels, but this story was delightfully told and focused on the normal relationship struggles faced by everyone- even, apparently, the Hollywood elite. A charmingly told novel, this story has two procrastinators, and no “bad guy”, which is unique in its own right. Honesty and vulnerability are themes that run rampant throughout. Well-told and beautifully written with charming characters, “Between Me and You” runs the reader through the emotional gamut. Tatum and Ben are a couple worth cheering for. The structure of this is ambitious and at first glance you may think it sounds confusing but I didn’t find it to be too hard to follow. It alternates with one chapter told from Ben beginning in 2016 and working it’s way backwards to 1999 when him and Tatum first meet then her chapters are told in chronological order. There are no big surprises since you know from the very start that where they are today is nowhere near that young, happy go lucky couple from their early days, but there was something bittersweet about reading one chapter full of resentment and bickering and then the next one is a sweet little anecdote from the past. It was unique and put a fresh spin on a love story and I admire the risk the author took, I can imagine it wasn’t easy to write.I’ve read a couple of Scotch’s books now and I what I really like about her style is that she can show relationships that appear real, they’re flawed, imperfect and wholly relatable. Getting to see a marriage from both sides was interesting, sometimes their individual perception of an event was so completely different from each other it was crazy but I think that’s an honest observation and true for any relationship. I liked the way the format played into the plot in the end, it was a little AHA moment that I appreciated. If you’re looking for a relationship drama/love story with a clever spin give this a try. As we kick off the early launch of my new book (be on the lookout for Goodreads galley giveaways), out January 9th, I wanted to share a bit about both it and the process of writing it. It was the hardest, most ambitious thing I've ever done, and there were plenty of times when it would have been easier to abandon it. But I was intent on exploring the idea of rewinding the history of our relationships - how time and life skew the innocence and joy of those early heady days - and what we can do, if anything, to get that happiness back.Thus Ben, one of my protagonists, tells the story of his marriage backward, while Tatum, his wife, tells it forward. They get wrapped up in all the small moments that life brings them, as well as the larger ones too - she is an actress, he's a writer - and as fame, disappointment, heartbreak, love, betrayal, parenting, death and triumph come their way, how do they stay on the course they initially charted when they first met? Can they? Should they?This is unquestionably my favorite thing I've ever written, and I can't wait to share it with all of you. I hope you enjoy it as much as I am proud of it. Happy reading! I received this book from NetGalley in exchange for an honest review3 starsI have long been a fan of Winn Scotch which is why I was very excited to read Between Me and You. However, this one just didn’t “do” it for me the way her other books have. I was pretty into the story until about the 45-50% mark and then it became repetitive and I found myself losing interest. The story is told in alternative POV and Ben is narrating the story backwards while Tatum is narrating forwards. I really liked this method of telling the story, but once the timelines intersected, I didn’t really care that much about the alternating point of view. It was like reading the same story again. Then, the last 10-15% picked up a bit as the story progressed to present day and a solution. As others have mentioned, there is no big aha moment, but Women’s Fiction usually doesn’t have that big climatic moment, which is fine. That is not why I read books in this genre. Overall, this book was not great, but not a total dud either. I found myself skim reading through much of the overlap. But I finished it, so that is saying something. I would say that this is not one of the better books that I have read by Winn Scotch, but I am a fan, so I will certainly be looking forward to the next book. I wanted to love this book, I loved the concept, but somewhere midway I started to wonder whether the main characters even belonged together. I wasn't sure whether to cheer them on towards reconciliation or not, and I sort of lost my way after that, unfortunately. I was honored to receive an advance copy of Between Me and You by Allison Winn Scotch. It is a beautiful book with deep complicated characters and an intricate plot. You will angst, laugh, cry and then smile. In today's times we desperately need epic love stories and Winn Scotch has provided a winner! ***ARC generously provided by Lake Union Publishing in exchange for an honest review. **Imagine the biggest regret of your life. What if you could dissect what lead up to it and study the future consequences of it and correct it. This is what Between Me and You accomplishes.It is written in dual point of view. Ben shows us the past, while Tatum his wife shows us the future. I will admit before I understood this formula I was a bit frustrated in keeping up with what was going on. I am not a big fan of timelines and points of views shifting to the past when the story has picked up traction and has gotten my attention. It's a big risk for an author if both points of view are not equally captivating. Yes Ben and Tatum's story were equally interesting. Every time I thought I would choose a side, I read another chapter.Ben and Tatum meet, marry, have a child, and find themselves in their dream careers. Yet life's disappointments and unexpected speed bumps occur, we watch their flawed decisions and want them to stay in love.. I loved their character development. The multiple POV's captured that very well. My only complaint was the excessive amount of inner monologue as opposed to actual conversation. The characters were charming, funny, I wanted to see them interact instead of constant lines of inner monologue narration which filled the plot. A character's thoughts are not nearly as interesting as when they are said out loud to someone else! A realistic romance that spans some twenty years proving the timelessness and loyalty of true love. 3.5 stars. What a fantastic book! I just finished it and loved every minute of reading it. The book begins in New York when Ben, a screenwriter trying to get his big break, meets Tatum, a struggling actress working in a bar. They fall in love and marry and move to LA where their lives begin to take different paths. Tatum becomes a well known actress and Ben is no longer a golden boy in Hollywood. As they struggle in different areas, the distance between them grows. Can their love and their family survive their current life and is there any way to bring them back together again?This book is unique because it's told in alternating chapters by Ben and Tatum AND told in different time periods. Ben's chapter may be about present day and then Tatum's chapter is about when they first met. It's a bit confusing at first but once you get into the rhythm of the story, it's a fantastic way of giving the reader both sides of what's going on in their lives and their marriage. It's also a good way to get to know both characters good points and their flaws.This was another fantastic book by Allison Winn Scotch. Thanks to the Great Thoughts Ninja Review Team for a copy of this book. All opinions are my own. Between Me and You is an intimate look at love, marriage, and all the intricacies that bring people together and also tear them apart. When they meet, Tatum is an aspiring actress, Ben is a fledgling screenwriter. As the trajectories of their careers go off in different directions, they lose sight of not only who they are, but how they see each other. Their story is complex and honest, my heart ached for each of them as they struggled with their insecurities and their evolving feelings for each other. I loved that this book was told from both of their points of view, so I could see what they see and feel what they feel. Highly recommend! Between Me and You is one those types of reads that makes you sit and think. Marriage isn’t always sunshine and rainbows, and this show us just that. Tatum and Ben fell in love, they marry and have this amazing life. But over time, the marriage seems to be one where two people just go through the motions everyday and they drift apart. Tatum was so vibrant and her love for Ben was never something I questioned. When her career took off, she got so caught up in it and everything else got pushed aside. Ben, was struggling with his career but not just that, he was struggling with Tatum’s success too. But his love for her was ever present too. These two had some major miscommunication issues, and those always lead to bigger problems.The story is told is told both Tatum and Ben’s POV’s, from the past and the present. It does jump around a little a the beginning, and I didn’t get lost, and I believe this was done so that we get the whole picture of what happened. Basically, one POV was in reverse, and the other in order and it worked well. Toward the end, it does start to go in order, so no worries. This is the first time I’ve encountered a set up like this, but I think it really laid out their lives and marriage all out for us. Their ups and downs and struggles were ones that some couple can relate to, maybe not the whole being famous thing but you know what I mean, the drifting apart. It wasn’t hard to relate to them both, and get swept up in their story. And before I knew it, I was so emotionally involved with them, I just couldn’t stop reading, I had to know what happened with them. Would they find their back to each other? Would everything they’ve been through keep them apart? It was such an emotional roller coaster but so amazing too.I want to tell you so many more things about this, and I could probably go and on, but I don’t want to give away anymore, it is one that you have to read and feel. Between Me and You takes us through an intimate look at love and marriage, and the betrayals and heartbreak that sometimes comes with it. It is one read that will stick with me for sure. I’m such a sucker for a great love story and this one definitely fits that bill. Tatum and Ben were divine when they were, and heartbreaking when they weren’t and I enjoyed the ride as they tried to figure out where they were going next.There were moments when I loved them and moments when I didn’t, but isn’t that just how life goes. I loved the back and forth as we discover what went wrong and why and I also loved their discovery of that as well. It felt very true to life and I felt as if I lived their story along with them. There were a lot of tears and throwing things and wanting to smack them a time or two. But there was also a lot of joy and goodness as well. I recommend this book to lovers of romance and family drama. This was a good one. I mostly loved it and it had the “feels” I love. It made my tummy hurt from the beginning- wondering how it would end and for all the miscommunications and bad timing that Ben and Tatum experienced. It did get a little redundant with the MC’s gripes/issues and it was somewhat confusing because the chapters were not in chronological order. (I had more parts highlighted and notes than I generally do, trying to keep everything straight). It is in dual pov, but I didn’t think it took away from the angst level. FYI it does have cheating. FirstLine ~ I told myself that if she showed, that would be the sign I needed.I adored this book. Winn Scotch has again delivered with a book that captures the audience through amazing characters, richness and depth in story and such universal topics. Winn Scotch is not afraid to really dig into topics that hit a cord with readers and force them to look inward and examine their own lives. I could not put it down and wanted to talk to others about this book. I think this book will make a great book club selection because there is so much to talk about and it is one of those reads that will cause emotional reactions. Another hit by a very gifted writer. This was a great read. I loved all the characters but have to say at some points I wanted to scream at Ben. Amanda Really!!!! I was so mad at him. He was this so called nice guy and instead of talking to Tatum and trying to let her know how he felt he goes and fools around with Amanda. I wonder after reading this book is this what a lot of the Hollywood relationships have to deal with. The jealousy and envy of each others relationship. Loved the style in which the book was written in the two person perspective and the opposite time line was interesting and something I have never read. I look forward to reading more from this author. Between you and me, Between Me and You leaves something to be desired.You see what I did there? I know it’s not funny BUT I CAN’T HELP IT.I want to start with the writing because this is undoubtedly my favorite thing about this book.Between Me and You has alternating timelines but with a very interesting take: our two narrators are telling the story in different directions. We have Ben, husband, telling the story from 2016 backward to 1999. And Tatum, wife, telling the story forward from 1999 to 2016. This is what I was most intrigued by even before reading the novel, and it’s what (mostly) kept my interest throughout. I think it could have been a complete disaster, but it is pulled off well and easy to keep track of.My one problem with the writing is that both stories are told in first person, present tense narration, and they were not different enough. At first, for instance, we read a chapter from a 40 year-old man, immediately followed by a 23 year-old woman, and there’s no notable narration difference. This is just not what I expect going into a double narrative like that, I really need unique voices.For me there are also some definite pacing issues. It starts off interesting enough, but toward the middle it becomes pretty slow and just kind of blah? This had to do a ton with the characters.Tatum actually does not bother me. She definitely has some selfish attributes, she puts work before her marriage and sometimes before their child. These things aren’t cute. But she does genuinely love Ben and Joey and she tries so hard. So much of the time she takes the brunt of their issues, even though from my perspective, Ben is a giant douche canoe.Ben. Well, I’m not a fan. I think a big part of it is that Ben reminds me very much of a very real, very particular type of person. A toxic man baby. One who can’t handle his wife’s success, resents her for it, doesn’t particularly love being a husband or father but blames his wife for not being a better wife and mother. He’s the very stereotypical, mentally vacant husband. Obsessed with himself and how to further his career and jealous of his own wife.Now, I don’t need to like characters to like a book. HOWEVER. When the book is possibly about reconciliation between our two narrators and I’m yelling, “DON’T GO BACK TO HIM, TATUM. YOU CAN DO BETTER, GIRL.” I am obviously not getting the full beauty of their love/loss of love/possible lean toward getting their love back.A HUGE theme in the book is grief. Ben loses several people close to him, but we cannot go one. chapter. without hearing about what his dad would be doing. Keep in mind that these chapters are almost all entirely spaced a year apart. So we’re talking over a decade where Ben cannot stop. Of course I don’t expect grief to disappear overnight. What I do expect is that you move on and not let it affect every other relationship in your life.All of these things made it very difficult for me to enjoy the book, because the entire book is about these two people and their marriage. Their marriage, for me, is not believable, and because of that, I can’t root for them.I so wanted to love Between Me and You. I wanted to root for Ben and Tatum, I wanted to be excited for them. Unfortunately I was mostly bored or actively irritated, and the most emotional I ever was in the story was about an incident involving their dog. *Thank you so much to NetGalley and the publisher for access to this book in exchange for an honest review. love love LOVED!!!!!! Her best yet! For the last 24 hours I've been glued to my iPad fortunate enough to have an early copy of Allison Winn's latest novel, Between Me and You. I can barely breathe. The story is told in alternating perspectives between Ben and Tatum---one rewinding history, one moving it forward. I loved this book. There's really no other way to say it. As an author, I'm amazed at how Allison strung the pieces together (alternating viewpoints and timelines is challenging) and as a reader, I'm amazed at how she effortlessly hit many of the notes husbands and wives, siblings, children, and those trying their hardest to fulfill a dream experience. This is a love story, but it's so much more. Allison's talent as a writer and storyteller are only rivaled by her emotional depth as she taps into love, loss, forgiveness (a big one), letting go, success, competition, self-awareness, betrayal, and the things we think about our loved ones, but are too ashamed to say. And I'm editing this to include our beloved dogs. Yes, Monster will steal your heart. Add this book to your TBR. You won't be disappointed. Releases Jan 9. At one point, I thought I might not finish this book. I couldn’t get into the style of storytelling at first and the story seemed like it would be bound to break my heart, a couple who has split up and the story is told from both them falling in love to them breaking each other’s hearts. I decided to give it a few more chapters and I’m really glad I did. 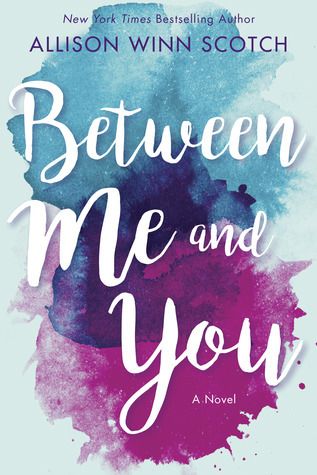 Between Me and You is the story of Tatum and Ben, but it’s also the story of how outside influences shape the future and the past, as well as shape our reactions and perspectives. I found myself really caring about Ben and Tatum and was invested in their future. The storytelling is a bold move, but it pays off. Just stick with the story long enough to let it impact you, because I’m glad I did. I received an advance copy from the Great Thoughts’ Ninja Review Team. All opinions are my own. Rock Bottom is often the ending point for some but for those who dare it's also the starting point.The world of denial, fascades, smoke n mirrors usually appears real but ladies and gents it's all a fantasy. Lust is different from love and this is enforced in Between Me and You.A vivacious, thoughtful, entertaining insight into marital discord and the ties that bind.Ben Livingston and Tatum Connelly are at a crossroads in their marriage. One seeks parental success while the others seeks internal motivation to succeed.How they combine the two is a recipe for disaster that leads to unchartered territory among affairs, random dates, empty promises, broken dreams and perhaps a re kindling of the old flame.The heart grows fonder in the absence of a loved one and this is magnified in this great work by Allison Winn Scotch.Though her writing is new to me the scenario and plot used is not. The old adage, " My life is stranger than fiction" is reality so for me it's relatable and a reminder of the desire to stay in a marriage for the betterment of all involved.The setting fluctuates back and forth between 2016-1999) with a strong reminder that "the only way to free oneself is to learn what you thought you couldn't know. "We see this emphasized throughout as romance is the prize, the token of love and affection, but also the truth of ones' worth and standing in value.Feeling abandoned and becoming increasingly distant in marriage Ben decides to take things to greener pastures with Amanda. Ben himself is learning lessons such that pleasing his father is not ultimately going to please him. He always sought the attention and admiration from his father that work hard and get rewarded attitude but it's costing him dearly with his wife and kid(s).Now as an adult he plays up the fantasy of having another woman and another person to sooth his frayed nerves and win his heart or will she.Tatum meanwhile is a go getter and is determined to make a name for herself to the extent of outshining her spouse Ben. Is this why their was so much turmoil? Perhaps?As readers are lured in further we see that the family on both sides is flawed. Tatum's brother Leo is a drug addict while her father is a drunk. Her mother has cancer and has done her best to keep the family together despite her own shortcomings.Now Piper (Tatum's Sister) comes forth to note that the father was distant and detached so it's a no brainer that Tatum would unfortunately seek out the same qualities in her husband and repeat the cycle.When things look shiny remember it may be simply fools' gold. As we age we hopefully mature and in this case show remorse, regret, and a shimmer of forgiveness.Love conquers all . Love not hate. All that good stuff. Warms the heart and soul.Yes, true and I'm glad that Allison shows the back and forth banter between these two main characters and the outside entries each one made.As many can see from my own profile my life was similar. My ex husband was a womanizer courting more women than years of our marriage. He had interchanged them which is the point of this story here. Prior to one relationship ending he was already entering the next target with one in waiting just in case it never worked out. A vicious game with real life consequences and destruction.Toxicity and Narcissism are alive and well in today's era. Having endured this saga it was as if you're married but single or better in my case he was single I was married as a prisoner in my own home raising a family while he lived the lifestyle of the rich and famous.I can note here in this case, that the husband Ben felt he was out performed by Tatum and they became gradually distant losing the one key element 'communication'.Each pretended to be ok, to be happy, to go through the motions of marriage with a smile without truly being connected in any way.Obviously this led to their separation and filing for divorce.I suppose it's all on your perception, lifestyle, upbringing so the views are varied.For those like self who lived this life I was captivated especially as we learned that Tatum at one point tried to win his love back in getting pregnant with a second child. Mine actually had a love child prior to us getting married ( sowing wild oats) and I learned of it after locating adoption papers that surfaced 11 years later.Playing detective to uncover truths is not how marriage is supposed to work and sadly many forget they need not be in a relationship to be happy. Being single and being lonely are two separate entities .Ok, I digress, rock bottom in this case was the starting point to rekindling what truly matters most.I read other reviews and I must say I'm shocked at some of the more popular well liked commentary at Goodreads as I disagree but I suppose you had to have lived it to understand it.To be able to sell oneself is key but so true that staying authentic is character building and crucial to true love being located.So without further ado , I truly believe you will not be disappointed.Power, control, fame, and fortune with 2nd chances being given is often at every problematic relationship yet here we see too that sometimes familiarity can make or break a relationship just as easily.Marriage is work and work takes time , a level of understanding, a commitment, and a love that stands the test of time. Great job Allison!Thank you to Allison , NetGalley, and Aldiko for providing me this ARC for this honest review. I was so excited to get an advance copy of this wonderful book. I am a huge fan of Allison's writing and have loved every one of her books. BUT, this one has to be my favorite. The love story of Ben and Tatum is told in such an unique way. Ben tells us the story from the present to the past. Tatum tells the story from the past to the present. They mesh so beautifully together. Events that occur in different timelines between the two versions seem to blend together perfectly. One could be talking about the rise of their career and one the decline but the feelings somehow fit together like a glove. This is a couple, that despite events that occur, you really root for. They meet cute (a bet in a bar) and make messes along the way. They are human with all the things we say, don't say, dwell on, move past. (They might even swear, wink wink) They are wonderful. There are lines that will make you smile. Some that will make you cry. And yes, I was crying at the end. My heart was full. This book doesn't come out until January so mark your calendars. Put it on your want to read list at Goodreads. Pre-order it. Just get it. I promise you will not be disappointed.